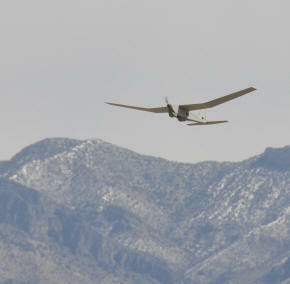 August 12, 2013 - AeroVironment announced that a recent outdoor test flight of a solar-powered prototype version of the company's proven Puma AE small unmanned aircraft system (UAS), operating with the company's newest long endurance battery, lasted 9 hours, 11 minutes significantly longer than the flight endurance of small UAS being used in the field today. AeroVironment's Puma AE unmanned aircraft system (UAS) AeroVironment is working with Alta Devices, a Sunnyvale, Calif. company that provides flexible, portable power that can be embedded into any other material, in the development of the solar Puma AE. "This is a critical milestone with far-reaching implications for the many ways small UAS can benefit military, public safety and commercial customers," said Roy Minson, AeroVironment senior vice president and general manager, Unmanned Aircraft Systems (UAS). "The solar Puma AE is the latest example of AeroVironment's longstanding commitment to deliver important, innovative solutions that meet our customers' needs. "Our integration of this cutting-edge technology dramatically increases Puma's current flight endurance using a clean, renewable power source," Minson added. "This development can give Puma AE customers significantly increased capabilities that approach those of the next class of UAS at a much lower acquisition and operating cost, and with much greater operational flexibility." AeroVironment's new long endurance battery extends Puma AE's non-solar endurance to more than three hours. This means small UAS could be used for longer missions over greater distances than previously possible. Minson added that past solar solutions for powering small UAS were either too heavy or did not produce enough power for long-range flight or both. "However," he said, "the solar Puma AE technology can produce enough power, while adding negligible weight, so that endurance is no longer an issue for most customer missions." Using a proprietary and highly differentiated technology, Alta Devices manufactures the world's thinnest and highest efficiency solar cells using Gallium Arsenide. This technology significantly extends the battery life of any application, in many cases eliminating the need to recharge from the grid because it converts more light into electricity. Solar material like that used in the development of the solar Puma AE incorporates a thin, mobile power technology on a flexible substrate that has been independently certified by the National Renewable Energy Laboratory (NREL) as world-records for both single (28.8%) and dual (30.8%) junction solar cells. Puma AE is a flexible, efficient and rugged hand-launched workhorse for intelligence, surveillance and reconnaissance (ISR). This solar-power enhancement makes it even more indispensable for U.S. and allied military, as well as for domestic public safety applications, such as firefighting, law enforcement, search and rescue, oil and gas field monitoring, and other commercial needs. The solar Puma AE configuration currently is in the research and development phase. A production version is planned for early 2014. Last month, AeroVironment received a "Restricted Category" rating for its Puma AE small UAS from the Federal Aviation Administration. The first-of-its-kind certificate permits operators to fly Puma AE for commercial missions in regions of the Arctic.